Immediately below this description is a slideshow of the photos, and below that are all the photos which can be viewed individually. What does trimming your pet rat's tooth look like? How do you do it? Here you'll find examples showing the real deal. Some rats are easy, some are hard. These videos don't necessarily show the perfect trimming but you can get an idea of what to prepare for, what the rat needs to tolerate, how to help her tolerate it, and how to clip. Always always always consult a vet regarding whether your rat's teeth need trimming. Normal bottom teeth are very long, upper teeth are shorter. When you see them together it can be easy to think the long ones are too long, when in fact they're just right. Also, establish a good medical reason for trimming teeth, as rats normally keep their teeth at good lengths without human intervention. Do not attempt to trim your rat's tooth without adequate assistance, and be prepared for emergencies. 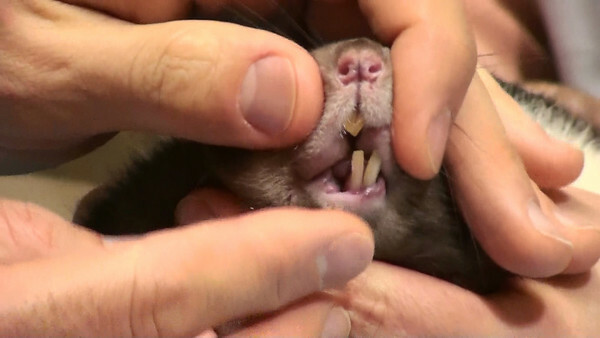 ALWAYS SEEK PROFESSIONAL CONSULTATION WITH A VET TO DETERMINE IF YOUR RAT'S TEETH NEED TRIMMING. Below are many links to normal rat teeth, maloccluded teeth, and methods for trimming. Visit all of them in addition to the videos in this gallery, for a well-rounded education in trimming rat teeth. SandyCritterCity - Those marvelous teeth!